I have been trying different kinds of clays. 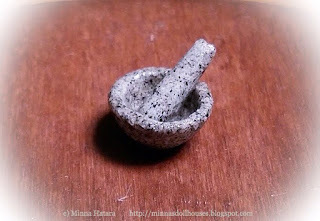 This mortar and pestle are made from air dry stone clay. I like the result very much, but I found working with the clay a a bit difficult as it was so... sandy! 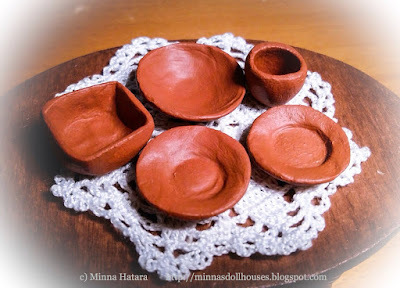 These rustic terracotta dishes are made from basic air dry Fimo. And here is a tray and plates which I decorated with water slide decals which I recently made. 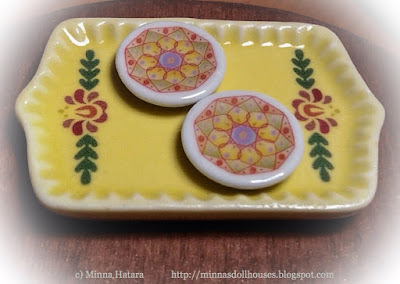 I have also been making some miniatures from silk clay and foam clay. I will post pictures of them soon! Todo bonito pero el mortero está fantástico. You did a wonderful job. All the items are beautiful! Great work. I especially like the mortar and pestle. Kauniita astioita, varsinkin tuo tarjotin! Un mortero u minis muy bonitas. Hola, muy bonito todo!! una preciosidad.